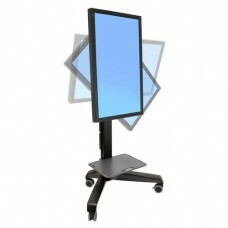 Bring digital content to life with Ergotron’s sleek Neo-Flex Mobile MediaCenter. With effortless height adjustment and integrated portrait-to-landscape capability, this cart stretches your investment by serving a variety of projection needs in rooms throughout a facility. Affordability, simple assembly and effortless operation make the Mobile MediaCenter perfect for digital signage, conferencing and other applications.